Kitchen cabinet and vanity cabinet (“cabinet”) sold by Kitchen & Beyond LLC is backed by a 1-year limited warranty on manufactured defects in material and workmanship under normal use from the time it is originally purchased. This limited warranty applies to cabinet used in residential applications in the United States, and the cabinet is warranted only to Kitchen & Beyond LLC’s direct customers and no warranty is extended to a third party. The original proof/ invoice of purchase is required when claiming. This limited warranty does not apply to cabinet that: (a.) is in any way modified; (b.) installed improperly, or damaged prior to and/ or during installation; (c.) installed outdoor; (d.) has been subjected to misuse, neglect, physical or chemical abuse; (e.) has been exposed to extreme temperature; (f.) has been exposed to extreme humidity; (g.) has been exposed to direct sunlight; (h.) damaged by fire, flood and other acts of God. In addition, normal incidental deterioration, such as nicks, scratches, abrasions and natural characteristics of wood (defined below) shall be exempt this limited warranty. Natural wood may vary in color, characteristics and exhibit subtle changes as they age. Environmental conditions, such as sunlight, smoke, steam, and household chemical cleaners will affect the color of the cabinet from time to time. These variations are considered to be the natural changes of wood but not defects that shall not be covered by this warranty. It is the sole decision of Kitchen & Beyond LLC to either repair or replace the affected components if defects exist during the warranty period. However, Kitchen & Beyond LLC updates its product line periodically. 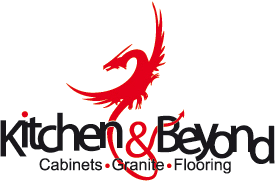 If the defected cabinet is discontinued, Kitchen & Beyond LLC. will reserve the right to replace the affected component with a new component of the same style or to replace the affected component and any other components to achieve a uniform appearance with a similar and comparable cabinet style of the originally purchased style. If the components are replaced, Kitchen & Beyond LLC cannot guarantee the finish of these replacements will match the finish and appearance of the components in the residential application. This warranty does not cover flooring, tile, sink, accessory, countertop, appliances, plumbing fixture, etc. or the costs, including labor to remove and reinstall materials and related components such as fittings. NO REPRESENTATIVE OF KITCHEN & BEYOND LLC HAS THE AUTHORITY TO CHANGE OR ENLARGE THIS WARRANTY. THE FOREGOING LIMITED WARRANTY IS IN LIEU OF AND EXCLUDES ALL OTHER WARRANTIES NOT SET FORTH HEREIN, WHETHER EXPRESS OR IMPLIED, BY OPERATION OF LAW OR OTHERWISE, INCLUDING BUT NOT LIMITED TO ANY IMPLIED WARRANTIES OF MERCHANTABILITY OR FITNESS FOR A PARTICULAR PURPOSE. TO THE EXTENT THAT ANY IMPLIED WARRANTIES MAY NONETHELESS EXIST BY OPERATION OF LAW, ANY SUCH WARRANTIES ARE LIMITED TO THE DURATION PROVIDED BY THAT LAW. Pre-fabricated granite, marble, quartz and other stone countertop (“countertop”) sold by Kitchen & Beyond LLC is backed by a 1 year limited warranty on manufactured deficiencies and fabrication from the time it is originally installed. Countertop is warranted only to Kitchen & Beyond LLC’s direct customers and no warranty is extended to a third party. The countertop will be either repaired or replaced if it fails due to any manufactured defect during the first year after initial installation. This warranty does not cover countertops that have been moved from their original installed location and it does not cover countertops that have been subjected to chemical or physical abuse. It also does not cover the natural characteristics of the stone, which include, but are not limited to, natural fissures, color variations, water lines or surface marks. Damage to the countertop caused by items out of anyone’s control, such as house settlement, fires, tornados or other acts of nature. This warranty does not cover flooring, tile, sink, accessory, cabinet, appliances, plumbing fixture, etc. or the costs, including labor to remove and reinstall materials and related components such as fittings. NO REPRESENTATIVE OF KITCHEN & BEYOND LLLC HAS THE AUTHORITY TO CHANGE OR ENLARGE THIS WARRANTY. THE FOREGOING LIMITED WARRANTY IS IN LIEU OF AND EXCLUDES ALL OTHER WARRANTIES NOT SET FORTH HEREIN, WHETHER EXPRESS OR IMPLIED, BY OPERATION OF LAW OR OTHERWISE, INCLUDING BUT NOT LIMITED TO ANY IMPLIED WARRANTIES OF MERCHANTABILITY OR FITNESS FOR A PARTICULAR PURPOSE. TO THE EXTENT THAT ANY IMPLIED WARRANTIES MAY NONETHELESS EXIST BY OPERATION OF LAW, ANY SUCH WARRANTIES ARE LIMITED TO THE DURATION PROVIDED BY THAT LAW. TERMS & CONDITIONS ARE SUBJECT TO CHANGE WITHOUT NOTICE. NGY STONE & CABINET, INC. RESERVES ALL RIGHT. This quality vinyl flooring is guaranteed for 25 years not to fade, wear through or stain. This guarantee only to the original purchaser and proof of purchase is required for all claims. The guarantee is for replacement or refund of the vinyl material only, no labor. The guarantee does not cover chipping vinyl will chip if sharp objects are dropped on it), warping (vinyl will warp if excessive moisture gets into the boards) or bridging (which is caused by insufficient expansion spacing). We will not consider any claims for these problems. Claims for wear must show a minimum dim size area. This guarantee is pro-rated based on the amount of time the floor has been installed. So if you have a claim after ten years, would refund or replace 3/5 of the vinyl value (10 years is 2/5 of 25 years). Simply dust mop or vacuum with a soft brush or floor accessory to keep your floor clean from dust, dirt or grit. A DAMP cloth or mop can be used without damage to the vinyl panels, but NEVER flood the floor. Do not use soap-based detergents, abrasive cleaners, or combined clean and shine products on your vinyl floor. Do not use steel wool other souring pads that may scratch vinyl panels. Do not wax or polish your vinyl flooring. Do not steam clean or use chemicals that may damage the flooring surface. While your vinyl flooring is highly resistant to stains and abrasions, it is not indestructible. In order to maximize the durability and beauty f your vinyl floor, we recommend the following practices as part of your floor’s normal care and maintenance. Place a doormat outside the exterior entrances to collect excess moisture, sand, grit and other potentially damaging substances from being tracked onto your vinyl floor. Use only colorfast and non-scratch carpeting or pads on your yinyl surface. Avoid sharp or pointed objects with concentrated weight such as high heels on your floor. Use protective felt pads under furniture legs or wide casters under appliance levelers. If using a wheeled dolly to move furniture or appliances on your vinyl floor, place a clean sheet of smooth plywood or other protective layer over your vinyl surface. Rearrange furniture occasionally for increased indentation resistance. Do not treat or seal your vinyl floor panels after they are installed. Never sand, lacquer, or refinish your vinyl flooring surfaces. Kitchen & Beyond Bathtubs come with a 1 year warranty against any leaks of the bathtubs. No warranty claims will be honored should the instructions not be adhered too. Faucets are not covered under the warranty. Professional plumber recommended for all installation. ***If your bathtub comes with metal bands around the outside, occasional tightening of the bands may be necessary. It is very important, especially in the first few months of receiving your bathtub, to check these bands. Note: Since the tubs are all handmade each tub will have its own unique qualities and characteristics, which means, No two tubs will ever be the same. Note: Wood is a natural material that responds to changes in temperature and humidity. These changes set up tremendous internal forces in the wood. If warping or edge cracking appears it is most likely related to uneven changes in temperature or humidity. To prevent drying out of the wood, we recommend frequent usage of the tub, especially in dry climates. The more you use a wooden tub, the better it is. Keep in mind that wood is a live, organic material. If your tub is not being used at least once a week, please make sure to fill it with water. That way the wood will stay in a good condition for years to come. ***As it is typical of all solid wood, hairline surface cracks may occur over the years.